I was hoping that by now (2016), and certainly given the availability of the Scrum Guide (since 2010), the basic understanding of Scrum was better. Accountability over the self-organized creation of Increments belongs to the Development Team as a whole. Synergy is key, not individualism. Transparency is optimized when Product Backlog holds all types of work and requirements for the product. The format and syntax of Product Backlog items is open for the teams to decide over. User Stories are certainly not mandatory. Burn-down charts were removed as mandatory from Scrum some years ago. It was replaced by the expectation that progress, regardless the format, is visualised on Product Backlog and Sprint Backlog. If Scrum was to be reduced to one purpose, and one purpose only, that is the creation of a releasable Increment in a Sprint. It is the basis of empiricism, of business agility. Imagine my surprise that this was not even mentioned, THE core purpose of Scrum. Scrum has no prescription that the Daily Scrum needs to happen standing up. Scrum’s interest is making sure that the team’s progress toward the Sprint Goal is inspected on a daily base, in order to allow the team to adapt. The Sprint Review is a collaborative event at which the Scrum Team and the stakeholders work together, and identify what is most important to work on next. Adding input from the stakeholders to the inspected, current state of the software (via the Increment), improves that decision. It is so much richer than a demo. 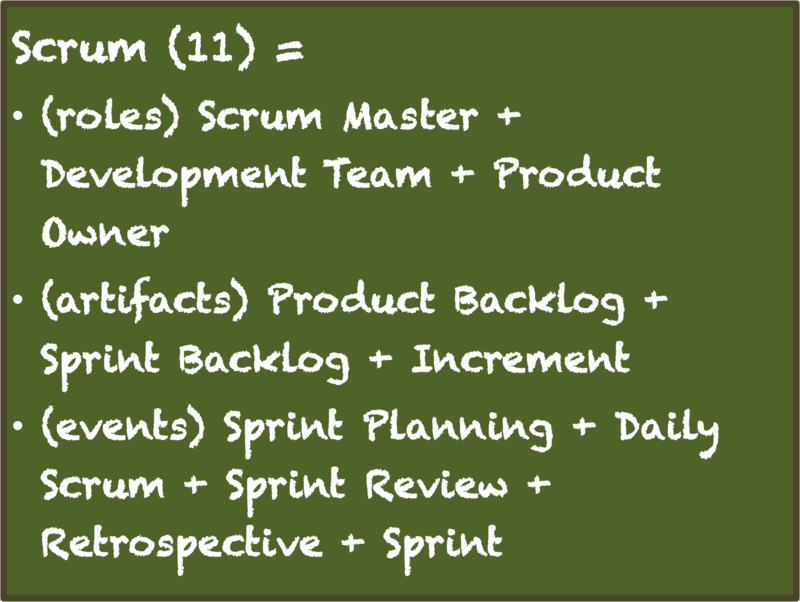 All events in Scrum are contained within a Sprint. Sprints take no more than 30 days, and often less. Not mentioning the Sprint as such (container) event might allow to overlook that aspect. 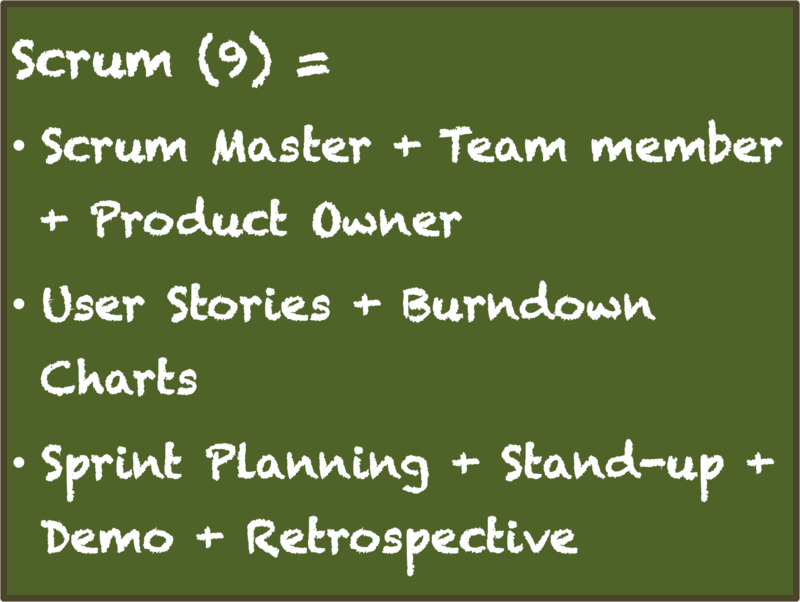 Misconceptions about Scrum. 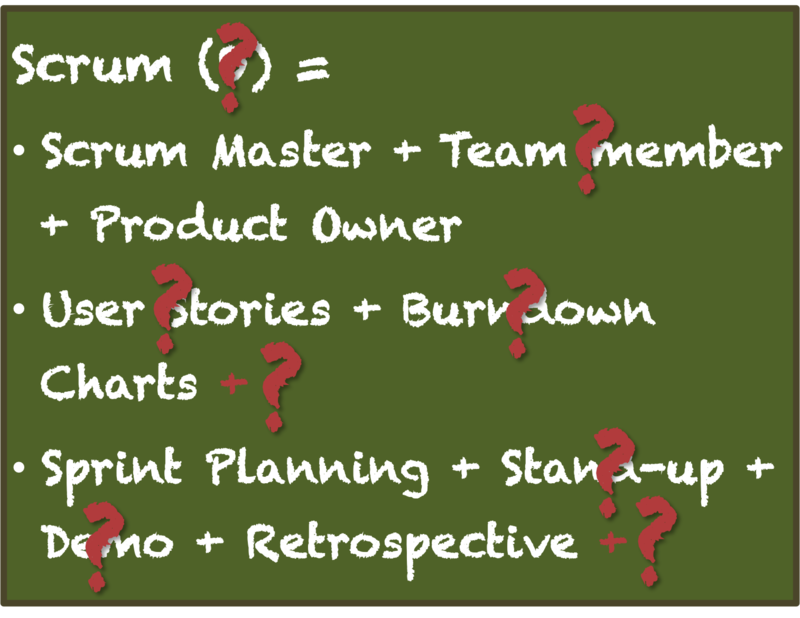 Why don’t you read and understand the Scrum guide? Even if the 11 elements of Scrum are satisfied, I believe there need to be organizational wide Scrum implementation strategy. I found often the lack of Transparency as defined in Scrum Guide 2013 is major obstacle towards effective Scrum implementation. Implementing Scrum under the radar with no consensus from the main groups (e.g. PMO, Product/Business Team, IT, Infrastructure, Operations, …..) will only lead to local optimization at best and usually to superficial. Ignoring to address the organizational structure that is not suitable for Scrum implementation can be a key inhibitor. Although these 11 elements are foundation but without optimizing the overall system, we will get only distorted and probably non-sense Scrum rituals. Hi Sameh, you are right. Here are similar considerations that I jotted down on stealth Scrum. That was 5 years ago, imagine. G.